I’ve really been enjoying spinning and making our own yarn. My spinning adventure began very slowly and clumsily, first trying to spin our earlier fleeces, which had shorter staple lengths, from rolags made using carding brushes. NOT a great way to get started! The following attempt was much more successful, but still not ideal. I had won some pencil roving at one of our CT Sheep Breeder Association Auctions and brought it home to try. This roving is drafted into a pencil thin roving and can even be used unspun for a more unique knitting style. Since it was so evenly drafted to begin with, it allowed me to practice the spinning part so I didn’t have to concentrate on two things at a time! I was pretty successful at this eventually – and by the third sample of roving I was starting to draft a bit and making the yarn thin enough to ply. I was pretty pleased that I had made something that actually looked like yarn! I even entered some in our town’s agricultural fair and won ribbons. But I still was not satisfied because I couldn’t say that it was yarn from OUR sheep! At last year’s fiber festival we were left with 3 or 4 fleeces unsold. I stopped by Fibers 4 Ewe’s booth and left them with her to have carded and pin drafted into roving. Finally, I was going to spin our own yarn from our own sheep! I loved it, and I was hooked on spinning! And now – I was left with a dilemma. How could I make this hobby more affordable? How could we make our own roving? We started looking into purchasing a carding drum but kept wondering if we’d have time to card and spin to make this purchase worthwhile. 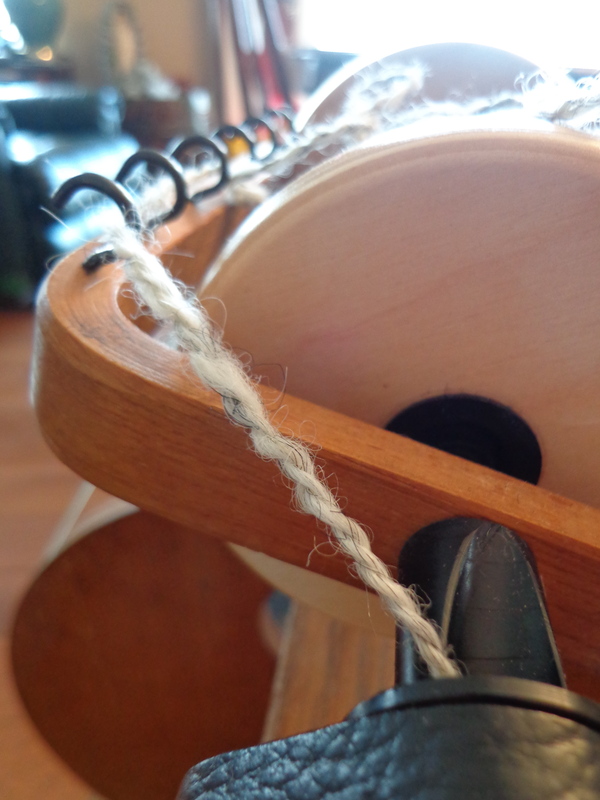 Some of our customers were purchasing fleeces last fall and mentioning that they had planned to “spin from the lock.” This concept fascinated me – could we make yarn without a carding drum? Could I save hundreds of dollars? I started watching videos on youtube of people spinning fleeces directly from locks and I had to try it! About a month ago I washed half of Shirley’s fall fleece. Shirley had one of our most voluminous fleeces with a very long staple length. It seemed to fit the bill for spinning from the lock. 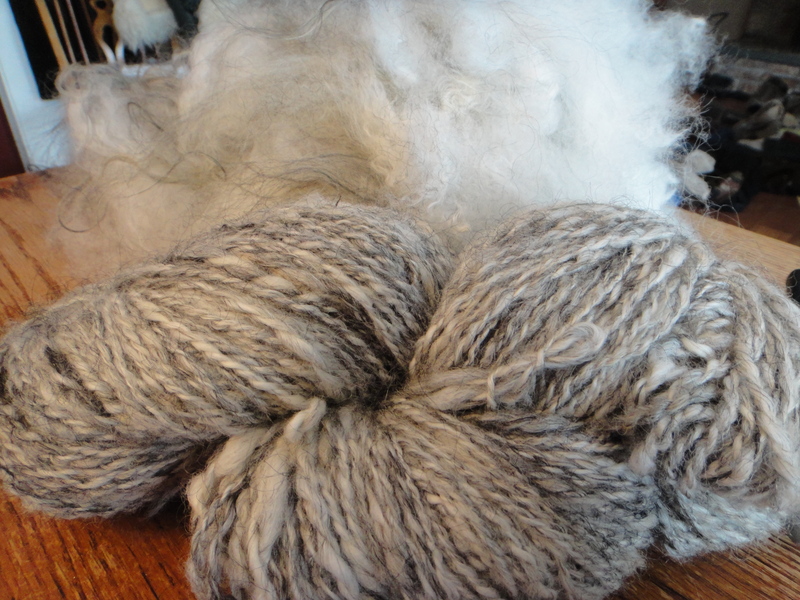 The biggest hurdle to this is met with the Icelandic fleece – it is an open fleece, meaning the fibers are loose to begin with, not matted together tightly like some breeds; it has a naturally long staple length, lending to making it easier to draft from the lock, and it is a low grease fleece, so washing is simple and the locks are kept intact during the process. So after washing the fleece and allowing it to dry completely, it looks like a clean version of what was sheared back in October. Each lock is tipped by every so slightly stuck together tog – the longer fibers. I just tear off locks one by one from the fleece. Using a cat’s flea comb, I gently tease apart the thel tips to completely open each lock. And finally…this! 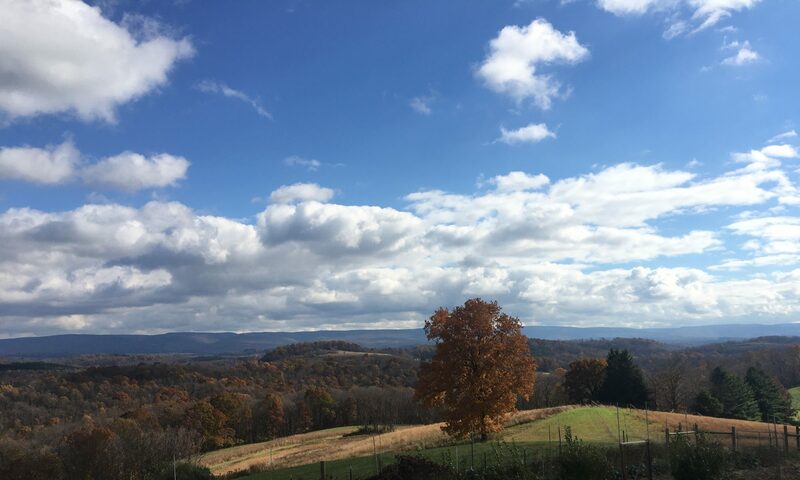 Our own yarn completely grown and processed right here on the farm! 2 thumbs up for a very thorough and educational post. I don’t know anything about spinning or yarn, but I do enjoy reading your posts about it. Your yarn is exceptional. What a wonderful end product! Thank you so much, Darlene – but I am such a novice! I’m working on another chunk of the fleece now for a second 2 ply skein. Some of the fleece is so open that I am literally picking off large pieces of it and just starting at one end and drafting from the fleece without any picking – it just lines itself up the whole way! Amazing! I thought spinning would be my winter hobby, but these hot days are so nasty that it’s a great way to escape to the air conditioning for a little while in the afternoon! Thank you for sharing your experiences. I’ve been spinning for about 6 months now (but I have more free time than most people, so it feels more like a year) and I’ve been saving money for some nice carders (maybe even a drum carder) the whole time. I’ve been trying to figure out a decent substitute that I can make do with until I can afford the real thing, but I never considered using a flea comb (even though I have a cat, so I always have a comb on hand). I’d still be stumped right now if you hadn’t published this article, so again, thank you. Also, your fleeces are absolutely gorgeous, and I would love to work with them in the future. Thank you! Glad it was helpful! 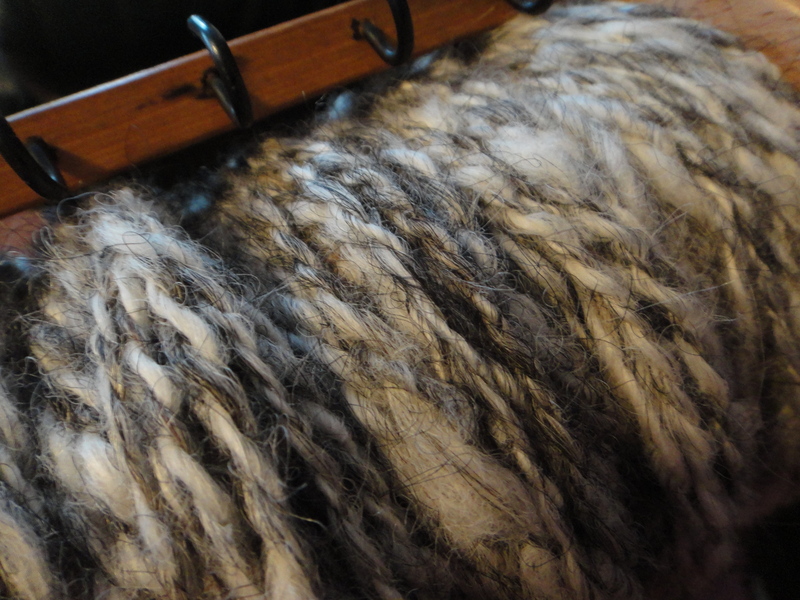 I was very close to buying a drum carder, but once I started spinning from the lock I really can’t justify the cost – of course the openness of Icelandic fleece totally lends itself to this. We will have fleeces for sale in October after the fall shearing!